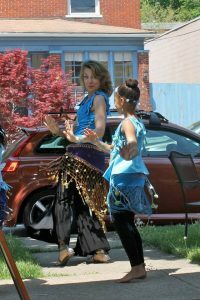 A team of belly dancers will perform on the streets of Berkeley Springs, West Virginia on Saturday May 12, 2018 as part of Shimmy Mob. 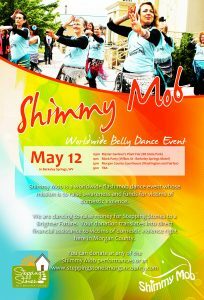 Shimmy Mob is an international dance event that includes over 2,000 dancers in 169 cities around the globe. The objective of the event is to raise funds and awareness for domestic abuse survivors. The Berkeley Springs Shimmy Mob team is led by Bellysima Bellydance instructor Angela Petry. The Shimmy Mob team will perform on May 12 at the following times and locations: 12:00 pm at the Master Gardeners Plant Fair in Berkeley Springs State Park, 1:00 pm at the Let’s Be Neighbors Block Party (Wilkes St and Rt 9 W), 3:00 pm at the Morgan County Courthouse, and additional surprise locations around town. This is the sixth year in a row that the team has participated in the charity dance event. The dancers are raising funds for Stepping Stones to a Brighter Future, a local non-profit that provides financial, emotional and life skills assistance to survivors of domestic violence. The group has been practicing their routine for weeks and will appear in the signature Shimmy Mob T-Shirt, the color of which remains a surprise until May 12. Over the past five years, the team has raised over $15,000 in individual and business sponsorships. Donations can be made in person, at the Morgan County Public Library, at Travel Berkeley Springs or at any of the performance venues on May 12. Donations also can made online by visiting www.SteppingStonesMorganCounty.org and clicking the ‘Donate’ button. Individuals and businesses interested in donating may call 304-995-5832 for more information.